(LOS ANGELES, Dec. 13, 2017) – With voters making cannabis legal in more states across the country, the Interest in marijuana and CBD products has never been higher. No site does a better job of connecting consumers with the best legal cannabis products and services than dispensaries.com. Signs of increased interest in legal cannabis products are everywhere. Voters in more than half the U.S. states have made cannabis legal for either medical or recreational use. Polls show a majority of Americans think marijuana should be legal. Google data shows the number of people searching for “Dispensaries Near Me” has skyrocketed in the last five years. But knowing which products and services are high-quality and trustworthy can prove difficult when hundreds of businesses have flooded the marketplace. That makes dispensaries.com the perfect place for the cannabis curious. The site focuses on showcasing the best businesses in the legal marijuana industry. 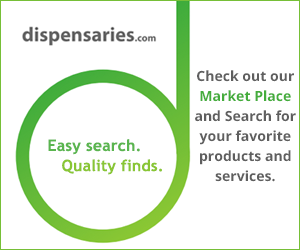 The dispensaries.com Market Place features products in a range of categories, including edibles, vaporizers, topicals, tinctures and cannabis fashion. They also feature cannabis-related professional services. The Market Place also includes CBD products, one of the fastest-growing areas of the legal marijuana industry. Derived from cannabidiol, CBD products treat chronic pain, aches, nausea and even depression and anxiety. The site’s services go beyond the Market Place. They include a wealth of news and information about cannabis business, culture and health-related topics. In its mission to support quality cannabis businesses, dispensaries.com has created the perfect website for cannabis consumers.